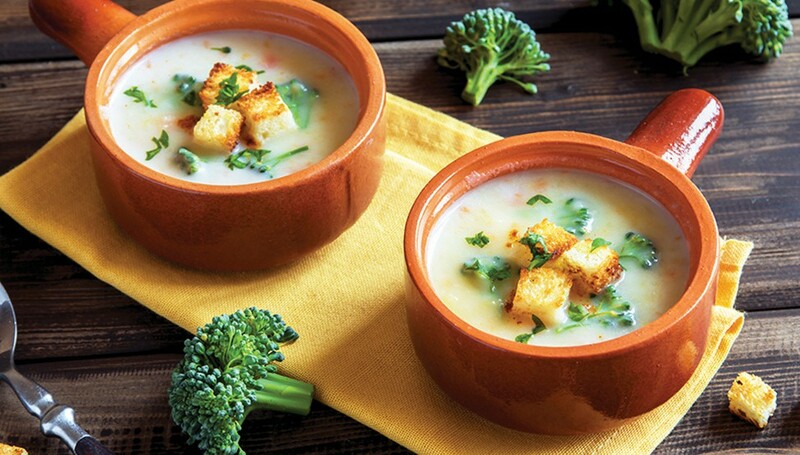 When the weather outside is frightful, a bowl of soup is SO delightful. Soup is an inexpensive and deliciously simple meal that offers plenty of health benefits. Try this wonderful soups and keep warm! Leftover soup should be reheated in the microwave on the defrost setting rather than the stovetop, where the cheese will “break” or separate from the broth. 1. Separate broccoli stems and the florets. Trim and discard the bottom of the stems and peel the tough outer layers. Finely chop the stems and coarsely chop the florets, and set aside separately. 2. Mist a large pot with nonstick cooking spray and heat over medium heat. Add the broccoli stems, onion and potato, and cook, stirring, until softened, 7 to 10 minutes. Add the flour and cook, stirring, until lightly toasted, about 2 minutes. 3. Stir in the broth and bring to a boil. Reduce heat to a simmer and continue to cook, stirring occasionally, until thickened and vegetables are tender, 12 to 15 minutes. 4. Meanwhile, combine reserved florets and 1/2 cup water in a small saucepan. Bring to a boil, cover and continue to steam until the florets are bright green and crisp-tender, about 5 minutes. Add the entire contents of the pot with the florets to the soup along with the nutmeg. Stir to combine and remove from the heat. 5. Stir in the Cheddar, Worcestershire and milk. Season with salt and pepper. Garnish with the scallions. Makes 6 servings. Angela Shelf Medearis is an award-winning children’s author, culinary historian and the author of seven cookbooks. Her new cookbook is “The Kitchen Diva’s Diabetic Cookbook.” Recipes may not be reprinted without permission from Angela Shelf Medearis.